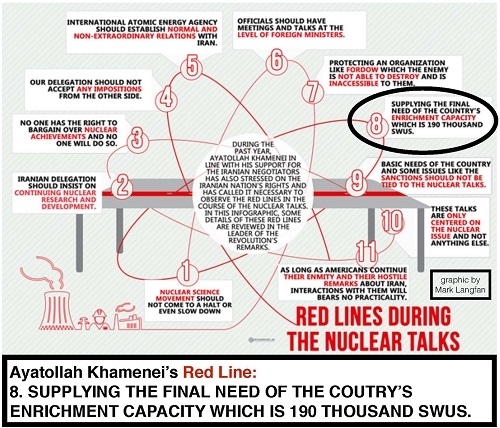 Arutz Sheva analyzes Ayatollah Khamenei's alarming demands in the talks with the P5+1, as outlined in a graphic he tweeted. “SWU” is an acronym for a “Separative Work Unit” which is a measure by which nuclear centrifuge capacity is measured to enrich uranium. Nuclear centrifuges separate the heavier isotope of uranium U238 from its lighter cousin uranium isotope U235. Natural uranium has a high percentage of U238 and a low percentage of U235. Only enriched uranium that has a high percentage of the lighter U235 isotope is useable for a nuclear bomb. Now, in order to calculate how many uranium nuclear bombs’ worth of enriched uranium “190,000 SWUs” of centrifuge enrichment capacity could produce per year, one has to know two separate figures: first, the amount of kilograms of enriched uranium needed for a nuclear bomb, and second, how many SWUs are necessary to enrich the required number of kilograms of enriched uranium. Sources such as A. Q. Khan, the father of Pakistan’s atomic bomb, and the Union of Concerned Scientists, estimates the amount of highly enriched U235 necessary for an implosion-type uranium nuclear bomb to be 10kg-18kg, and for a simple gun-type bomb – about 40 kg. IAEA defines a “Significant Quantity,” or “SQ” of highly enriched Uranium to be 25 kg. 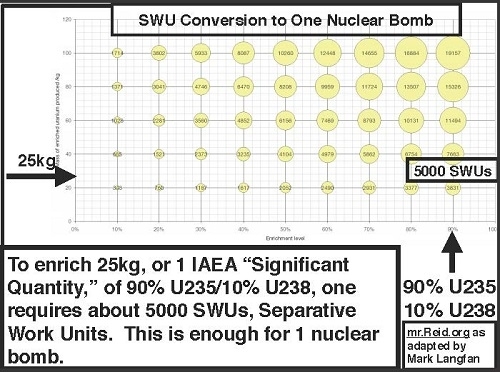 So, for purposes of the “SWU/bombs per year” calculation, the IAEA “Significant Quantity” estimate of 25 kg of 90% U235 / 10% U238 uranium is a good basic number of kilograms of enriched uranium needed for one uranium nuclear bomb. The scientific “MrReid.org” website has generated a SWU graph which easily calculates the amount of SWUs needed to produce a given enrichment percentage level of U235-enriched uranium to a specific kilogram amount of the enriched level of uranium. The “Mr. Reid-SWU” chart states that 3,831 SWUs are necessary for 20 kg of 90% U235 enriched uranium, if one starts from scratch with unenriched uranium. So, approximating and rounding up for 25 kilograms of 90% U235, the number of SWUs necessary is about 5,000 SWUs. 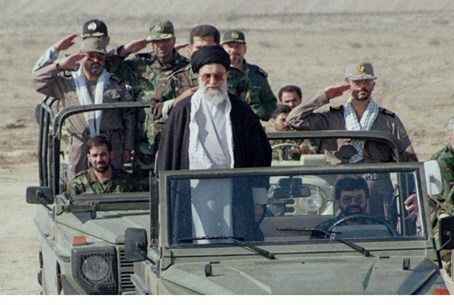 Since Khamenei stated that Iran needs at least 190,000 SWUs, that means he is demanding that Iran needs enough nuclear centrifuge capacity to enrich 38 uranium nuclear bombs per year (190,000 SWUs per year / 5,000 SWUs necessary to produce one nuclear bomb). This amount of centrifuge capacity demanded by Iran will surely meet opposition from Israel, which has demanded Iran be barred from any centrifuge capacity whatsoever. Recently, at the UN General Assembly, PM Netanyahu explained that many countries that use civilian nuclear power have no need for any centrifuge capacity, because outside countries enrich the fuel necessary for their civilian nuclear power plants.